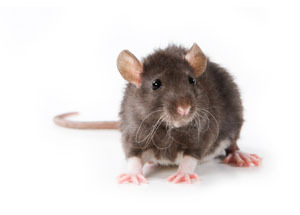 Appearance - Rats have red eyes, black or white fur, and shrieks. They are typically 6-10 inches long (depending on the type) with a hairless tail. Brown rats (also known as Norway rats) are slightly larger than roof rats, with a thicker body, smaller eyes, and a shorter snout than their black rat cousins. Behavior - Rats tend to be bigger than mice or other rodents, often found in basements, garages, outside near garbage disposals and even scurrying around your home. They are nocturnal. Rats can fit into holes that are ½ inch or even smaller, so having any open holes or gaps in your home may be a way that rats are getting in. Rat droppings are pellet-like in appearance.They are dark colored and about ¾ inch long. Rats, like any other species, need a place to live and breed. Homes, garages, and apartments provide the perfect location for rats to keep safe and be able to eat, sleep and reproduce without disruption. Holes in your foundation or walls that lead from a basement or outside are an opportunistic entrance for rats to find their new accommodations within your residence. Being able to fit in ½ inch or less spaces gives rats a leg up in entering your home, even if you have tried to fill in obvious holes and gaps in your walls and foundation. Having rats does not mean you live in unhealthy conditions, but having food sources accessible could entice a rat to enter and begin living in your home. Professional rat control is recommended before one rat turns into a full blown rat infestation. Rats tend to scrounge through garbage for food, and this causes them to be carriers of many different bacteria and diseases. They also are known for being traditional carriers of fleas and ticks due to the conditions they tend to live in. Flea bites from rats can cause extreme allergic reactions and ticks can carry Lymes disease. Beyond topical threats, the bacteria carried on rats can cause leptospirosis, which can affect the liver and kidneys, and salmonellosis, which produces cramping and diarrhea. These threats and the rat droppings they will leave behind could cause you and your family to become very sick if a rat infestation is left untreated.